(Logan, UT – January 28, 2019) Altra’s Elite Team dominated the charts of Ultrarunning Magazine’s Ultrarunner of the Year with seven athletes selected for the top 10 male and female ultrarunners of 2018. The annual ranking is highly anticipated every January by the athletes, sponsors and fans in the ultrarunning community. Jeff Browning took second after an incredible year running five 100-mile races. 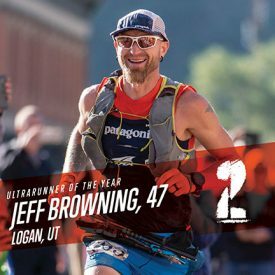 Browning won the legendary Hardrock 100, the Antelope Island Buffalo Run and the Pinhoti 100 along with placing third at Run Rabbit Run and fifth at Western States Endurance Run. In 2019, Browning will take on the Western States Endurance Run for the fifth time along with defending his title at Hardrock 100. His favorite shoe is the Altra Lone Peak 4, a medium cushioned trail shoe available in four options: low and mid heights with either mesh or RSM (rain, snow, mud) waterproof uppers. Coming in fifth was newly-signed Hayden Hawks after a successful year of international racing. Hawks won the Laveredo Ultra Trail in Italy—one of Europe’s most competitive ultras. He also won Penyagolosa in Spain, Mainad Ultra in India, Un Tour en Terra du Jura in France and took second in The Coastal Challenge in Costa Rica. Hawks’ favorite shoe is the minimally cushioned Altra Superior trail runner. Jason Schlarb was ranked sixth on the list thanks to his wins at Run Rabbit Run, Ultra Trail Oman and the Desert RATS 50k. He also placed second at the Eiger Ultra Trail 101k in Switzerland and the Mt. Gaoligong 55k in China. Schlarb prefers either the Altra Duo or Lone Peak for varied terrain he tackles. The Duo is incredibly lightweight and speedy for being a max cushion shoe and the mesh upper quickly drains water, while the Lone Peak easily tackles muddy, snowy and wet courses. The seventh spot was awarded to Amanda Basham and Zach Bitter. Basham won first female at the UROC 100k, was second at Tarawera 100k in New Zealand and Sciacche Trail 50k in Italy, and finished fourth at Western States Endurance Run. Bitter set a world record for the fastest 100-mile on trails with a 12:08:36 at Tunnel Hill. He also won the Mesquite Canyon 50k, the Crown King Scramble 50K and the Whiskey Basin Trail Runs 88k, all in his hometown of Phoenix. Both Basham and Bitter prefer to run in the Altra Superior. The eighth spot was given to Sabrina Stanley and Mark Hammond. Stanley won first female at Hardrock 100 despite being waitlisted until just a few weeks before race day. She also won the Marathon Trail Lago di Como 74-mile race in Italy, the Tortola Torture 54k in the British Virgin Islands, the Orca Island 50-miler, the Monadnock 50k and placed third at HURT 100. Stanley’s new favorite shoe is the Altra Lone Peak 4, which she wore to win the 2019 HURT 100. Hammond placed second at Run Rabbit Run and third at Western States Endurance Run along with finishing eighth at his first international race at Ultra Trail Mt. Fuji. He also won the Across the Year’s 24-Hour race, Trail Trashed Ultra 50-miler, the Deschutes River 50k and the Stone Mill 50-miler. Hammond’s go-to shoe for race day is the Altra Duo. Stay updated on Altra’s Elite athletes by following the Team Altra Facebook page.